Over the past 10 years, Sustainability defined as Social, Environmental and Economic performance has been on the agenda of all procurement teams. The initial focus was on managing risks and achieving desired levels of compliance with companies’ commitments and existing sustainability standards. Today, sustainability is taking a more centre stage position within business activities. It is now time for Procurement to look beyond compliance matters and to further integrate sustainability in its activities and goals. We need to see the pursuit of environmental and social performance as a core business requirement and as an opportunity to optimize cost and create value. 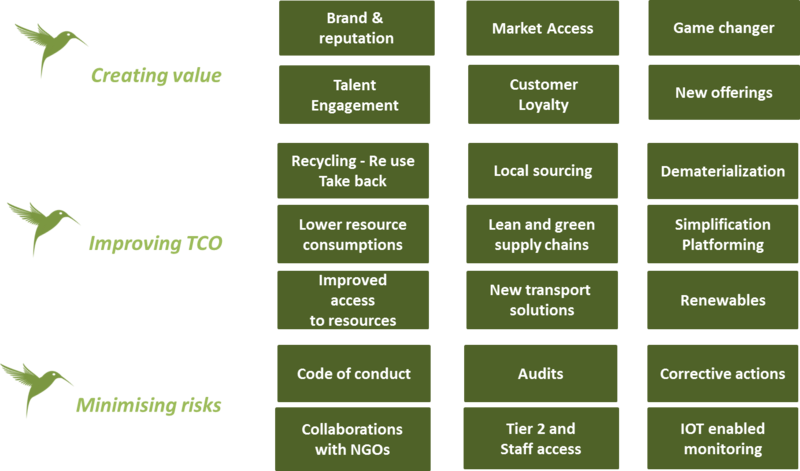 The table above outlines some sustainability levers that purchasing teams can build on. It can be used as map to trigger discussions within a project, or for a purchasing segment. This is not an exhaustive list but a good starting point. Underneath we describe how we see this evolving in the years ahead. From a risk management point of view, we will see more efforts on communicating and enforcing codes of conduct. A lot has been achieved but more will take place. Monitoring suppliers’ practices, implementing corrective actions and establishing basic improvement projects will become more systematic and will be turned into an efficient routine activity. In the years to come we will continue to see the development of sustainability scoring and assessment services. In this area, collaborations with not for profit organisations who have a privileged access to some suppliers will become more usual and well-organised. Gaining visibility beyond the first line of suppliers will remain a challenge. Some companies such as Vodafone have started to offer some of their suppliers’ employees specific channels of communication to report sustainability issues. Each player along the chain will be expected to monitor its own first line of suppliers. New opportunities will emerge from current business transformations. Big data and the Internet of things will enable remote monitoring of the condition of equipment, workers, goods and supply chain. Start-ups such as provenance.org have already taken steps in this direction. To simultaneously improve financial, social and environmental performance buyers will increasingly consider three different strategies: First, they will leverage their supply market knowledge, doing so offers opportunities to secure access to quality resources at a good price. In the food industry, companies such as Danone have changed their commitment to farmers to achieve this. Such initiatives will without doubt inspire other companies and industries. In the same vein, we will also see cannier use of sustainable transportation solutions, renewable energy and materials. Second they can work with stakeholders to reframe requirements so social and environmental performance can be improved while cost can be reduced. Some companies have started to bring together life cycle analysis and life cycle costing to achieve this. Also, many recent developments in packaging are great examples of the aforementioned. By reframing requirements and looking creatively at solutions it is possible to reduce resource consumption, it is possible to adopt leaner and greener processes and sometimes what needs to be sourced can be radically simplified. Third by revisiting operational and business models, new levels of performance can be achieved. Products can be efficiently recycled, reused or taken back by suppliers. In this area, Philips has established collaborations with Not for Profit Organisations and governmental bodies to implement “circular procurement” practices. Local sourcing strategies will flourish in some industries to deliver positive financial and sustainability impacts. New technologies will help personalise and dematerialise business activities so costs, waste and risks are eliminated. If we stay awake and if we bring people together to implement new ideas, purchasing can improve its performance and gain recognition as a driver of change. Finally sustainability is increasingly part of a company’s product offerings and competitive advantages. This is an additional opportunity for purchasing teams to create value for the business. Working for the greater good motivates people, it creates loyal customers, it strengthens the brand and it provides opportunities to develop new offerings. By working closely at early stages with suppliers, purchasing can create value and achieve higher levels of sustainability. New markets can be explored and game changing innovation can be introduced. Constraints can make us see the world with different eyes so we can emerge with fantastic results.